Are you looking for a delicious vegetables recipe with a difference? If you are, you’ve found it! Here’s my pasta with aubergines, tomatoes and garlic sauce for you to enjoy. 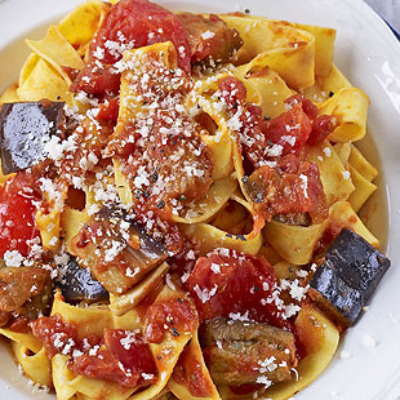 Many people steer clear of aubergine and yet it really is an easy vegetable to prepare. In this sauce, it enhances the tomato flavour without overpowering it, so if you have children who don’t like their vegetables, try this dish – they’ll hardly know it’s there. I often serve this pasta as a starter but be careful with portion sizes as you don’t want to fill everyone up before the main. Tagliatelle can also be used and if you ever have any sauce left, you can use it to accompany a plain grilled fish dish. 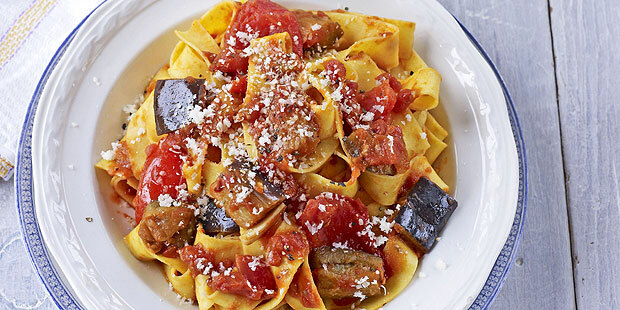 Feast your eyes on the finest pasta with aubergines, tomatoes and garlic sauce! It’s straightforward and fun to make this great dish. Simply follow the instructions below and get the perfect result. Measure 2 litres of water into a large saucepan, drop in the stock cube, and bring to the boil. Prepare the aubergine by trimming away the last 1cm from both ends, along with any green bits. Cut the flesh into 3cm cubes. Cook the cubed aubergine in the boiling stock for 8 minutes. Drain through a colander and set aside to cool. Once the cubes are cooled, slightly squeeze them in the colander so that any excess water drains away. Heat the oil in a large frying pan and gently start to fry the garlic for 1 minute. Add in the aubergine and continue to cook for 5 minutes, stirring occasionally with a wooden spoon. Tip in the chopped tomatoes, season with salt and pepper and continue to cook over a medium heat for 15 minutes, stirring occasionally. Add the basil and the quartered tomatoes and cook for a further 10 minutes, stirring every couple of minutes. Meanwhile, cook the pasta in a large saucepan of salted boiling water until al dente. Once cooked, drain the pasta and tip back into the same pan. Pour over the aubergine sauce and gently stir everything together for 15 seconds to ensure all the flavours combine. Serve immediately sprinkled with a little Parmesan. 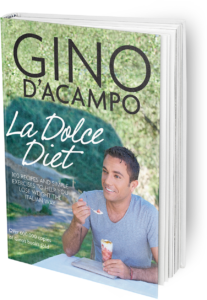 Once you’re done, simply sit back and enjoy your pasta with aubergines, tomatoes and garlic sauce and don’t forget to check out other great authentic Italian recipes including great antipasti recipes, Italian pasta recipes, Italian soup recipes, Italian beef dishes and authentic pizza recipes.